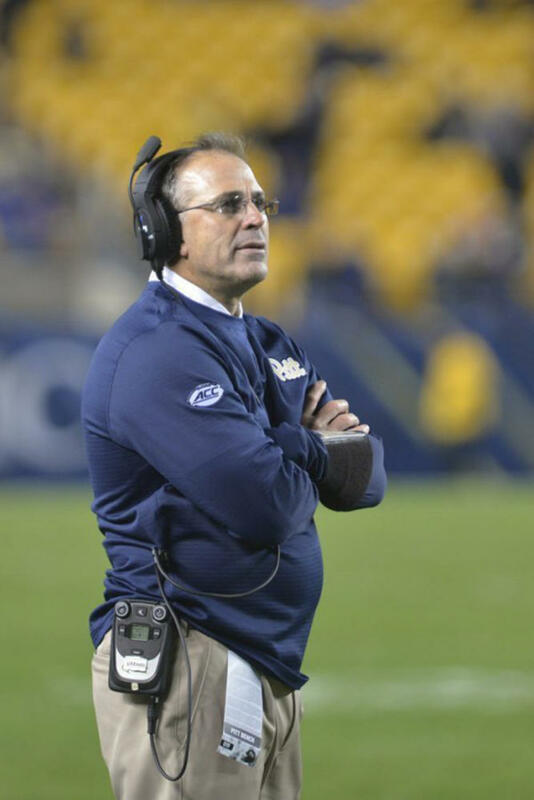 With his disciplinary actions against four players at the start of training camp, Pitt football coach Pat Narduzzi proved something the past three head coaches weren’t able to. He’s committed to the program — for the long run. The Panthers have had four head coaches since 2010 who left the position — some forced out, some voluntarily moving on to more established programs. After a relatively disappointing 7-5 season in 2010, the program fired coach Dave Wannstedt, the last leader truly dedicated to the Panthers, replacing him with Michael Haywood of Miami University in Oxford, Ohio. Haywood never got the chance to show his coaching ability — Pitt fired hime just 17 days into his tenure after he was charged with domestic battery. The turnover continued with Todd Graham, who came in a few weeks later looking to turn the Panthers into a high-tempo offensive machine. Not even a year later, though, he bolted for Arizona State, announcing his departure via a forwarded text message to the players. Paul Chryst — the best of the three coaches, by default — arrived in 2012. And although he stayed for three seasons, he too left, going back to Wisconsin and giving the Panthers the stigma of being a stepping-stone job for coaches. When Narduzzi arrived for the 2015 season, fans wondered whether he would just be the latest in the cycle. After more than two years, though, he’s proven he won’t be, and that was strengthened July 28 when he dismissed senior defensive end Rori Blair and suspended three others. The suspensions of junior safety Jordan Whitehead and senior linebacker Quintin Wirginis are the most impactful of the three. The two players will miss the first three games while redshirt junior offensive lineman Alex Bookser will be eligible starting week two. These suspensions are important because the first three games of the year include perhaps the Panthers’ two biggest matchups — Penn State and Oklahoma State. ESPN ranked the Panthers’ nonconference schedule as the toughest in the country, and the team would’ve needed to play extremely well to win even if Whitehead and Wirginis were on the field. It was a bold move for Narduzzi, especially in a culture which often lets athletes off the hook for the sake of winning games. In the past, some of the country’s high-profile athletes — including 2013 Heisman Trophy winner Jameis Winston — received smaller punishments for violating school or NCAA rules. This is a refreshing reminder that some coaches still believe in discipline and making players learn from their mistakes. At the same time, it’s something which would only be done if the head coach cared about the long-term future of the program. If Narduzzi was more focused on the short term, Whitehead and Wirginis would only be missing the Youngstown State opener, which the Panthers will likely win without them. Then, their punishments would be almost meaningless, and the season could still go smoothly with Narduzzi continuing to build his resume as a winning coach. But, by sitting them out of the Penn State game — massively important not only for the season, but for fans and the program as a whole — he has undoubtedly hurt the team’s chances in the hopes it will set a precedent moving forward. This isn’t to say coaches who levy light punishments don’t care about the long-term future of their programs, but rather that they put winning above accountability and their athletes’ personal lives. So clearly, this is a big statement from Narduzzi. Even so, it isn’t the first time he’s done something with his long-term plan in mind. This past season, the team’s beleaguered pass defense was largely a result of Narduzzi trying to implement his coverage schemes with the players. The unit was atrocious last season, averaging the second-most passing yards allowed in all of major college football. It was arguably the main culprit in each of the Panthers’ five losses, with opposing quarterbacks able to successfully air it out all game long. The fans and media alike questioned Narduzzi’s tactics, saying he should have the linebackers help out in the secondary as opposed to having outmatched cornerbacks in one-on-one coverage on the outside. But he stood his ground and continued to teach his players, taking beatings in the meantime. To be clear, he didn’t abandon them, rather he decided to do things his way and wanted to force his players to learn it. After all, there’s no use in providing help if your end goal is to take it away and implement a different system — something Narduzzi touched on at his ACC Kickoff press conference in July. By doing this, the secondary already knows what Narduzzi wants and has a year of experience in the system. Over time, the unit will pick it up more and more, and the performances will get better. For now, though, the coach is willing to take the setbacks he’ll likely suffer this September. One can only wait and see if his vision for the program comes to fruition, but at least he should be here to see it through. And for a program labeled a “stepping-stone job” not so long ago, that’s worth a lot more than it might sound.